Choose the required input to output signal conversion to view table. This input to output conversion tool provides an easy way to determine the ideal linear output produced by a measurement instrument for any given input value. 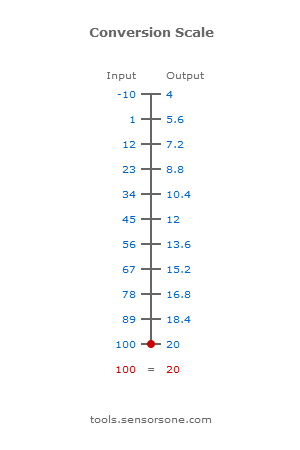 A conversion scale for each input and output range combination entered is also displayed below the calculated answer. Enter the measurement unit associated with the input values. This is the input measurement reading you would like to convert. Enter the minimum possible value of the measurement device input range. The value can be a negative or positive value and should be in the same engineering units as all the other Input values. Enter the maximum possible value of the measurement device input range. The value can be a negative or positive value and should be in the same engineering units as all the other Input values. Enter the minimum possible value of the measurement device output range. The value can be a negative or positive value and should be in the same engineering units as all the other Output values. 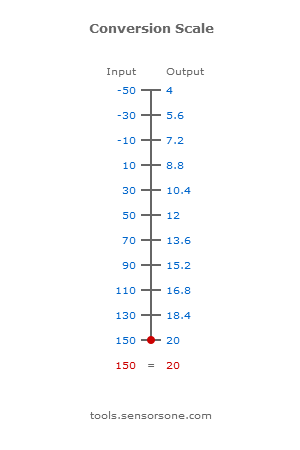 Enter the maximum possible value of the measurement device output range. The value can be a negative or positive value and should be in the same engineering units as all the other Output values. This is the ideal Output from the measurement device for the Reading specified for the Input and excludes all measurement device errors and uncertainties. Can this calculator be used to convert an output to an input? Yes, just switch them around and enter the output values to the input section and the input values to the output section to determine the ideal input value. Can I use this input/output calculator to calibrate a measurement device? Yes, but bear in mind that the conversion does not include any errors related to the measurement device or the calibration reference standard, so it can be used to compare the actual measured output readings with the calculated ideal output readings. What are the 4-20mA values for a -50 to +150C temperature tx? Use this graphic to check what milliamp current is produced from a temperature transmitter with a range of -50 to +150 degC, or for more precise conversion values use this calculator to convert any value from -50…+150degC to 4-20mA. What 4-20mA values from a -10…+100C temperature transmitter? 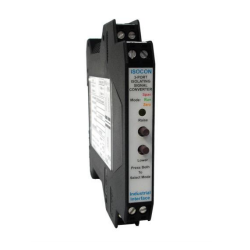 Send us your enquiry for a product associated with this Input to Output Measurement Reading Converter page, and get assistance with selecting a product for your application.